Crossing the Western Sahara is one way to connect the Atlantic to the Red Sea; this was the objective of the "sand cruise", organised by two experienced reporters, Christian Galissian and Constantin Brive. To meet this challenge, the organisers looked for sponsors and meticulously prepared their expedition, which would open a new route to the Northern Sahel, marking it with beacons erected in the open desert. 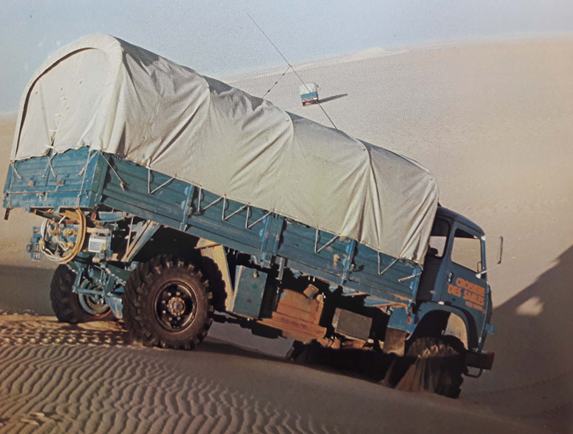 A SAVIEM truck used on the expedition. SAVIEM provided them with first-class equipment: seven SAVIEM all-terrain trucks, five TP3 trucks and two SM8 trucks, all specialising in a particular field. Total supplied the fuel; Panzani, the food; Thomson CSF the radio links; the French National Geographic Institute (IGN), a navigator, etc… The team comprised twelve men between the ages of 23 and 65 years, each of them a specialist in a particular field and a truck driver. Following a reception at the Town Hall of Paris on 15 December 1976, the team left the French capital for twelve weeks of adventure, broadcasting on RFI once a week.